We're on a mission to show DIYers how you can build it for less using materials from Habitat ReStore. Take this cool-cat catio, built by Business Relations Director Mark Haley. Salvaged plywood pieces for "landings"
I really wanted to incorporate a salvaged old wood sash window somehow in this design, so it ended up being the roof! That determined the overall depth and width of the design. I decided on no more than 7 feet for the height. That will reach most exterior windows for easy pet access and make for simple handling. For the base I used a piece of ¾” plywood re-purposed from a shipping crate. Under the deck, I added 4x4 runners salvaged from donated cedar fence panels to raise it off the ground. I figured out a nice roof slope and cut and screwed the wall studs through the bottom of the plywood base. I used salvaged wood wherever possible to add blocking for the exterior screen attachment, the framing of the front door, the cat access opening and the simple top plate to finish off the walls. After framing the door as big as I could for easy access, I painted all the wood with some safe latex paint from one of our ReStores. With open framing there’s not many ways to brace the structure or provide any overall sheer strength, so I trusted the screen to do that and it did! I attached the wire screen to the studs and base with a pneumatic stapler, pulling it as tight as I could, making the structure nice and strong. I mounted the door and roof (window) with hinges and added some gate hardware to the door for a secure closure mechanism. To finish things off I built the different “landings” and climbing pieces from more of the salvaged plywood and some natural Birch tree branches from my backyard. I made it easy on myself and used screws for all the framing and assembly fasteners. The finished Catio can be easily moved upright or laid on its back using an appliance hand truck or a wheeled furniture dolly. Overall I spent just under $50.00 for the non-salvaged materials and had lots of wire left over for other projects. There are as many types and styles of Catios as there are cats and owners….so have fun with it! This catio will be on view at Habitat ReStores beginning this month. You can also see it at the Cat Fancier's Association International Cat Show November 18 - 19 at Portland's Expo Center. 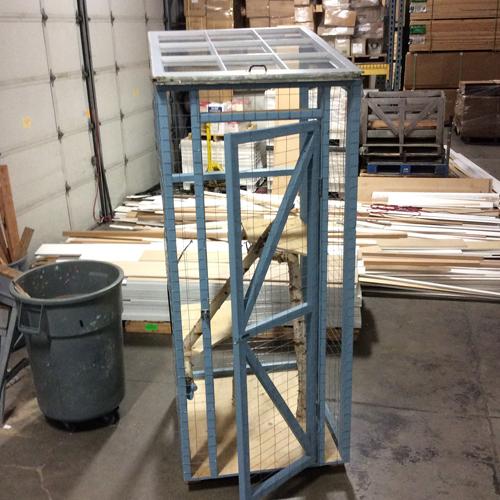 If you build one of your own, please share photos with us by emailing mcerna@pdxrestore.org.